Malou has worked for various media agencies based in Manila and overseas. She has done journalism for print (as editor-in-chief of a national newspaper), radio (briefly as a program host), and television (as executive producer and program host). 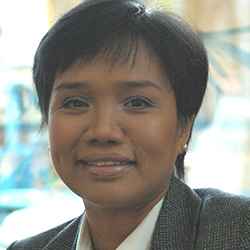 She was the first editor-in-chief of gmanews.tv online, while working as Vice President for Research and Content Development of GMA News and Public Affairs. She has conducted journalism training across Southeast Asia and won many awards for her work.